Due to the recent upgrade of our state-of-the-art laboratory, coupled with research and development into increasing lab efficiency, we are able to permanently offer the basic Y-DNA12 test for $49 beginning April 1, 2013. The current sale of Y12 at $39 will end at 11:59PM CST, March 31,2013. We are also working on bringing down the price of the basic mtDNA test as well; we hope to have that accomplished during the first half of this year. Given the increase in the volume of orders and tests, we are adding additional people in our Customer Service department. These are all qualified personnel that receive very specific training and who give an individual answer to each email and phone call that they receive under almost every circumstance. Our policy always been to answer email between 24 to 48 hours (excluding on weekends), and we are working towards coming back to this norm. We apologize for the inconvenience that delays beyond this norm have caused and we appreciate your patience and support while this situation is being corrected. 1. Making sure that our Laboratory Information Management System (LIMS) works flawlessly so that there are no mix-ups in the lab or errors during processing. 2. Making sure that results coming out of the lab are seamlessly integrated with the personal records from our customers. 3. Writing the code for new features to be implemented, whether those features are conceived in-house or at the suggestion of our customers. The following post by Judy G. Russell on her blog The Legal Genealogist is a must for any resident of Georgia or any researcher with ancestors who lived there. 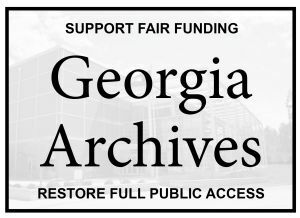 The state archive is in danger of being closed or severly restricted. PLEASE ACT NOW! YOUR VOICE DOES MATTER! Enjoy, but act before it is too late! Is your genealogy stuck in the U.S.? Colonial America? Australia? New Zealand? Are you unable to cross the pond? Are you doing research on a single name? Do you need testers for your DNA Project? Could you be at a dead-end due to surname spelling changes? 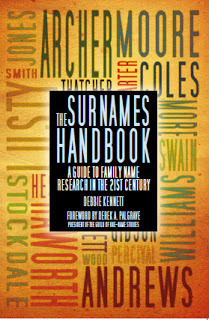 Answering YES to any of these questions and many others makes Debbie Kennett’s latest book, The Surnames Handbook: A Guide to Family Name Research in the 21st Century required reading. Debbie’s work could be the strategy that fit your needs! Even though this is written for the British audience, Debbie includes information from many other counties, and the material and methods here are beneficial to all genealogists and genetic genealogist. Although written with the underlying suggestion of doing a one-name study, her approach is necessary in forging backward in time and for solving any of the above questions. Even if you do not plan to conduct a surname study, this source can help you pin-point where your surname in the U.K. could have originated or where it existed at a particular time. Debbie begins with a history of surnames and explains the attempts to classify them over the past centuries. She then clarifies the differences between variants and deviants which is greatly important to know when you are hunting for an ancestor’s record and find nothing. Other chapters discuss surname mapping, surname frequency, surname origins pre-1600s, and more. She covers the use of DNA and the benefits of One-Name Studies. The span of the resources is amazing: information and websites on old handwriting and dating systems, parish and county boundary changes, various records which are online, and details about various records and when where they existed. She explains the reasons for creating the Pipe Rolls, Lay Subsidies Rolls, the Hundred Rolls, the Feet of Fines, the Hearth Tax, and many more. I cannot begin to list all the important and useful information. For those of us who know little about records in the U.K., the historical background and lists of websites and documents given in this resource is invaluable. What others have spent years learning, you can access quickly through all the websites she has mentioned. For many Americans the information on medieval resources is very valuable, and most American genealogists do not understand the British record keeping system over the centuries. This book helps you quickly learn about the records in the U.K.
Debbie’s book bears reading multiple times as it is so full of great information (am I repeating myself! LOL) . So much so that one needs to take notes or tag pages for a revisit. Know that the electronic versions have hot links for all the websites she mentions so you may wish to order that version. This book should be used as a workbook to explore your surnames and to locate living potential DNA testers. It suggests reconstructing families of a rare surname or those in one area to determine if all the people are related and to obtain probably testers for DNA when you bring those lineages to the present. DNA testing living people who are in the area where your ancestors were and with the same surname can find you actual cousins and help establish your roots in the motherland. With so many resources, my plans are to turn to Appendix A: Genealogy Websites and to go systematically through the online resources for my Ogan One-Name Study and to reconstruct my family surnames in the U.K. for my DNA surname projects (Derby, Doolin, Lamson, Ogan, Talley, and Stubblefield) in order to find potential DNA testers in the U.K. in time for the next Who Do You Think You Are? Live conference and to invite them to attend so I can give them a free DNA kit in hopes some will match my lines. Then to plow through my other ancestral surnames. Then there is the linguists resources, the Place-Name Resources, etc. Oh, to have a few clones to help! Frankly, this book is a must for all genealogists and genetic genealogists! Order it from Amazon.com for your Kindle or in paperback or for your Nook at Barnes and Noble. Who Do You Think You Are? Live, the world’s largest genealogical conference, started with a bang this year. The figures were up 9% from last year, and are as follows. knew attendance was good. Saturday appeared equally busy, and although there was drop in Sunday’s visits, we knew it was higher than last year. 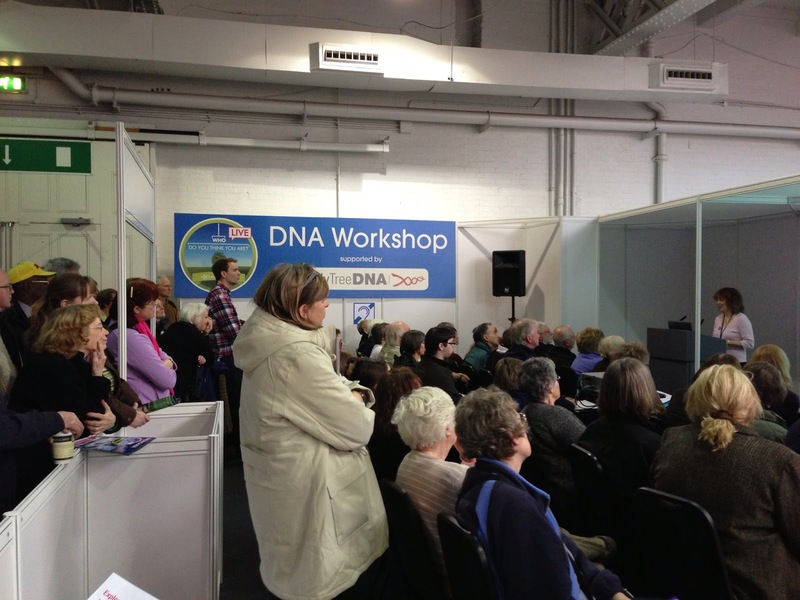 Friday always has the highest volume, and Sunday is typically slower, but this year the FTDNA stand was still busy on Sunday, as well. Family Tree DNA sold over twice as many test kits this year as in previous years, so we are finally making an impact in the UK. 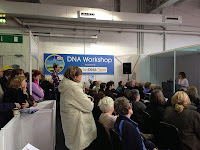 The presentations for the FTDNA stand were very exceptional. Most speakers were from the U.K. which helps bridge the gap between cultures. Dr. Michael Hammer from the University of Arizona spoke about our ancestral origins, including the recent discovering of haplogroup A0 and A00 initiated from citizen scientist Bonnie Schrack who had called attention to a curious situation in her DNA project and involved the geneticists. Debbie Kennett explained to novices the three major tests, and her presentation was well received. Scottish DNA was covered by Alasdair McDonald, and Tyrone Bowes explained how to use history and geography to find where our ancestral name probably originated. Katherine Borges spoke about the DNA of various famous people. Bruce Winney presented A Genetic Analysis of the People of the British Isles, and Chris Pomery informed the crowd about Traditional Genealogy and DNA One-Name Studies. Max Blankfeld covered DNA and Female Lines. 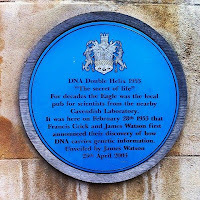 The presentations covered a nice range of topics and greatly informed the British population what is current in the DNA world. We had our usual dinner at Pizza Express on Friday after the first day of the conference. Max Blankfeld, Vice-President of Family Tree DNA, received his sheep from Brian Swann who for several years has made presentations to various members of our group. The ISOGG (International Society of Genetic Genealogy) stand listed 107 surnames with variants...more than in past years...which could receive a free Y-37 marker test at the courtesy of the respective project administrators. All one needed to do was to be male with the surname and walk by to notice your name on the chart. Seventeen tests were given away for the following surnames: Burton, Dunbar, Fitzgerald, Hunt, Parker, Pearse, Phillips, Phillipson, Stokes, Taylor and Wright. Some administrators of these projects received more than one tester. Congratulations to all of them. I greatly encourage DNA administrators to use the resources available online for the U.K. to bring to the present probable male testers and invite them to show up at next year's conference. In some cases, this may be the only way to connect to your lineage in the homeland. Every year Brian Swann has suggested and organized some great adventures. This year he out-did himself! The Down House trip (Charles Darwin's home) on Thursday and the trip to Cambridge and on to Hinxton to tour the Wellcome Trust Sanger Institute the following Monday were fantastic! Who could resist visiting the home of Charles Darwin, the man who established that all species of life descended from common ancestors and pioneered the idea of evolution? 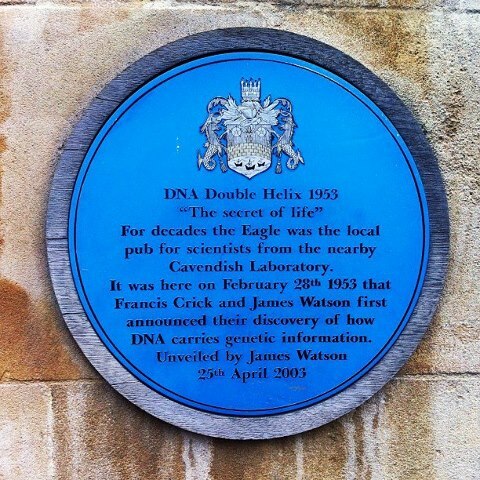 Who could resist visiting The Eagle Pub for lunch where Francis Crick and James Watson first discussed the Double Helix, according to the plaque outside the door, and The Wellcome Trust Sanger Institute where in 1992, this new center was formed to be the British arm of the Human Genome Project's sequencing efforts? For Tuesday, Derrell Teats, one of our group from the U.S. organized a tour of Stonehenge, Bath and other interesting cities along the route. Our guide was delightful and informative. At Stonehenge, Maurice Gleeson and I ran into a spiritualist who runs the Talking With Capricorn blog. She states she is a tetragametic chimera which is very interesting to us genetic genealogists. The all-day trip was wonderful, returning us to the B&B just after 9 p.m. We needed a bit more daylight at the last stop, Avebury, to see the largest set of standing stones which are three circles, one within the other and to have more time at the The Lions Pub in the center of inner circle of stones. 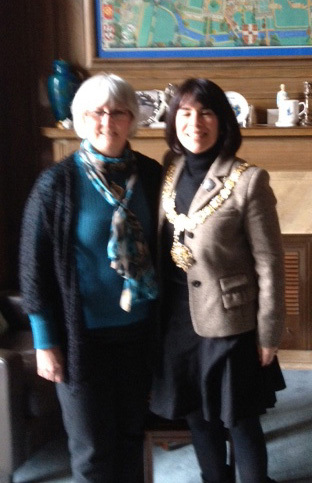 While in Cambridge, I had the pleasure of meeting the mayor who just happens to be an Oregonian. After seeing a news article about her in my local paper, I emailed to congratulate her and to invited her to have lunch with us at the Eagle Pub, just around the corner from her office. I greatly enjoyed visiting her. She volunteered herself and her husband for a DNA test, so promptly two kits came flying at us from the other tables of friends. She promptly returned the samples to FTDNA, and I'm sure she and I are both anxious to see the results. It may be difficult to top this year's trip as far as our side trips are concerned, but there is so much to see and do that no one would be disappointed in the coming years. This is your invitation to join us next year!